SB 331 establishes statewide regulation of Ohio’s retail pet stores, creates new standards of care for pet stores, and prohibits pet stores from sourcing puppies from unregulated, poor-quality kennels, sometimes referred to as “puppy mills.” And in another very important provision, it provides alternatives to local proposals that sought to end most dog breeding and would have forced pet sellers to sell only pets sourced from shelters or rescue distributors. The Ohio House on Wednesday passed legislation to block next year’s special election to raise Cleveland’s minimum wage to $15 per hour. Forcing the sale of only shelter dogs — and not allowing sales of purebred dogs from breeders — not only violates the rights of pet shop owners and breeders, it also does nothing to reduce shelter numbers or improve animal welfare. When consumers cannot get a pet that is a good match for their lifestyle, that pet is more likely to end up in the shelter system. Prohibiting local pet-store regulation is yet another unnecessary — and in this case, untimely — assault on home rule in Ohio. Senate Bill 331 should be shelved, writes the editorial board. Importation laws require all dogs to be examined by a licensed veterinarian, but the U.S. Centers for Disease Control and Prevention in 2014 warned of growing numbers of cases of “questionable documentation” of rabies vaccinations and other paperwork omissions with some imported dogs that may arrive in the United States carrying serious and infectious canine diseases. Assisting pets in need of homes is laudable, but putting responsible breeders out of business or limiting the ability of prospective owners to obtain a pet of their choice and a good match for their lifestyle undermines any benefits derived from assisting shelters. Close to one million rescue dogs are imported annually from as far away as China and Korea. What’s more, a rescue pet is not appropriate for everyone. Many have special needs that may not fit into the owner’s lifestyle or care abilities. People select purpose-bred dogs because they want a specific type of pet. They may be seeking the predictability of a purebred puppy from known and health/temperament-tested parents or the consumer protections provided by state law. The Ohio law succeeds on several fronts. 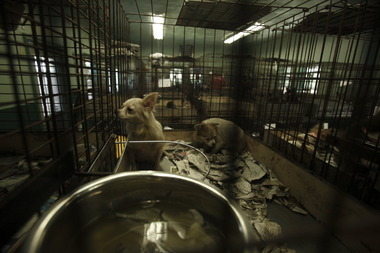 * Unlike proposals in other states, it won’t spur the import of even more foreign dogs. Other states are eying “puppy mill” bills that would ban pet stores from sourcing professionally bred pets, which would dramatically expand the foreign dog problem. * It will protect consumer choice. * It will improve animal welfare by establishing state regulations mandating that purpose-bred dogs in retail stores must come from U.S. Department of Agriculture-approved kennels — and the law is very clear that those kennels must be in compliance with federal animal welfare standards. * It will raise the bar for pet businesses, requiring them to demonstrate their commitment to animal welfare. The joy of loving and caring for dogs is as old as humanity. The Ohio law ensures that anti-breeding extremists don’t derail that timeless relationship. Sheila Goffe is vice president for government relations of the American Kennel Club based in New York.